There’s an easy way to get that perfect cat eye look you see on your fave celebs in the magazines. It’s less about the products you’re using , and more about the tools. I’m obsessed with my Sephora’s Professional Angled Liner #15 brush. I use Sonia Kashuk black eyeliner in a pot, which you can get at Target. 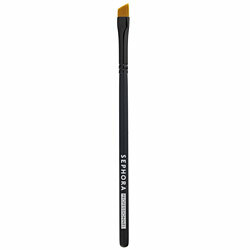 The brush is super thin, yet firm enough to lay the eyeliner exactly as you want it. The angled edge makes that whisker end look, a breeze. This brush can be used to fill in brows too. I said fill in , not replace, yes new jersey strippers I’m talking to you.